sc s15 had the most liked content! Bugger. Was hoping you would get this finished one day. I'm running Yaris coils. Always had a misfire with splitfires. No issues with the Yaris ones at 300rwkw on e85. When you say the intake pressure line is hooked up to the same line as boost controller, do you mean just the pressure feed to the controller? Your pressure feed to the solenoid comes from the turbo outlet/intercooler piping doesn't it? Rear ball joints should be the same. 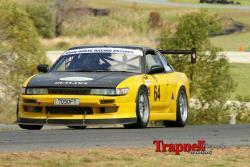 Only the S13 front ones are different from any other S chassis. Don't use heater hose if possible. Go to a hydraulic hose place and get something oil resistant. Solid should work the same. I can't see any issues. Which throwout bearing carrier do you use with the Mazworx kit? I had a bit of stuffing around with throwout carriers and spacing the pivot ball to get it right. I cant remember exactly which combination I ended up with. Just the normal S chassis Nismo one I think? I had to space the supplied gearbox crossmember down 10mm or so with washers to get it to fit properly. The tunnel needed some more bashing but I CBF pulling the box out again. Pretty sure S14 and S15 use the same length tailshafts. They have steel on ally shafts for ABS or non ABS. Just ask them, they were helpful when I was inquiring. No idea on Maverick vs Collins. I know Maverick have sold a fair few. Both me and SJB87 have their kit without any major issues. I only check mine by measuring it before I put it in, from memory it was within a mm or 2 of the z32 spline length. I machined the 10mm off the bell housing as well. I also added a couple of dowels to the adapter plate and box to help line it up a bit more accurately. I also bought my tailshaft from Shaftmasters in the US. Including postage it was cheaper to buy it from there, apparently the yokes are rare as well. Thanks Sam. Are you still running the Z33 and what kit / shifter etc did you end up using ? Did you just get the box from Concept Z ? Yeah still running it, haven't had the box out in the 2 yrs since I put it in. It looks like SJB87 is using the same kit as me. I'm using a Maverik motorsports kit and a CNC shifter bracket (not sure what brand they are, google images you will see it). Using a factory shifter, I wouldn't want anything shorter, it's already got a pretty short throw. I actually bought the box and kit from someone that bought 2 in when the dollar was really good, so not sure where it came from.